The d20 System is a role-playing game system published in 2000 by Wizards of the Coast originally developed for the third edition of Dungeons & Dragons. The system is named after the 20-sided dice which are central to the core mechanics of many actions in the game. Much of the d20 System was released as the System Reference Document (SRD) under the Open Game License (OGL) as Open Game Content (OGC), which allows commercial and non-commercial publishers to release modifications or supplements to the system without paying for the use of the system's associated intellectual property, which is owned by Wizards of the Coast. The original impetus for the open licensing of the d20 System was the economics of producing roleplaying games. Game supplements suffered far more diminished sales over time than the core books required to play the game. 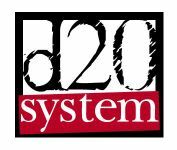 Ryan Dancey, Dungeons and Dragons' brand manager at the time, directed the effort of licensing the new edition of Dungeons and Dragons through the 'd20 System Trademark', allowing other companies to support the d20 System under a common brand identity. This is distinct from the Open Game License, which simply allows any party to produce works composed or derivative of designated Open Game Content.